Polaris Releases the Only High Performance Sport ATV with Independent Rear Suspension. 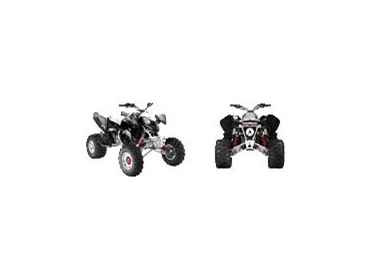 Home > Polaris Releases the Only High Performance Sport ATV with Independent Rear Suspension. With class-leading features and attitude to burn, the Polaris Outlaw leads the thriving sport ATV market in engineering innovation. Outlaw is the only sport ATV on the market with independent rear suspension, making it the perfect sports trail quad for tackling Australia’s toughest terrain. As ATV enthusiasts are aware, ‘Nothing Rides Like a Polaris’ - and Outlaw will further reinforce this reputation in the global powersports market. The 5-speed Outlaw is powered by a liquid-cooled, high-performance Polaris 500 engine. It’s a high-revving, four-stroke, four valve powerplant with a double overhead cam. Outlaw breathes in through a 42mm BSR carburettor and breathes out through tuned 2-into-1 header pipes. All this, combined with its leading power-to-weight ratio and superior acceleration, makes for a super-responsive quad that can go from 0 to “eat my dust” in no time flat. “Polaris is thrilled to have Outlaw here in Australia,” said Polaris National Sales Manager Peter Harvey. “We’re confident this machine will revolutionise the sports quad market. Just take a look at the features and you’ll see that Outlaw is miles ahead of anything else in its class. Keeping both rear wheels on the ground, the Outlaw’s PRO IRS gives greater control and higher speed capability over rough terrain by smoothing out ruts and bumps. The anti-sway bar provides the handling of a straight axle in the corners, while its 29.2cm of ground clearance is more than twice that of straight axle ATVs. PRO IRS keeps the rear wheels stable and in contact with the ground in all conditions to allow more traction and less sliding, allowing you to stay on the throttle through turns and over rough terrain. The added ground clearance of PRO IRS helps avoid trail obstacles that bash the straight axle and sprocket of old-school sports ATVs. While other riders have to ease up on the throttle when they hit the rough stuff, on the Outlaw you can push it. The centre-mounted exhaust is another industry-first innovation from Polaris, not only making your ATV look that much cooler, but also centring the mass for better weight distribution. The new Pro Steering delivers virtually zero bump steer with a much lighter weight design, while the large diameter and stiff steering post provides vastly increased strength. And adding to this impressive package is a front suspension design that absorbs impact and increases control, delivering an improved ride through all types of conditions and obstacles. Capping off this unique high-performance quad, Outlaw also comes complete with electric start, industry-first single-link forged upper control arms, Dunlop Radial tyres, Douglas aluminium rims, Fox Shocks with 25.4cm of travel, front dual hydraulic disc brakes and forged aluminium lower control arms.